Iranian President Hassan Rouhani and his team, including Foreign Minister Mohammed Javad Zarif, continue to boast that the Islamic Republic is not in favor of hard power. Instead, they say it prioritizes soft power in the region, such as employing diplomatic initiatives and dialogue in order to address regional and global issues. But the reality on the ground tells a totally different story. The Islamic Republic has ratcheted up its projection of hard power to an unprecedented level. On Saturday, Iran launched a medium-range ballistic missile. 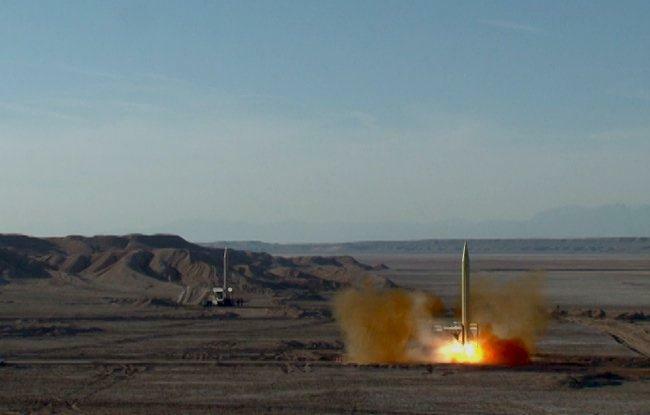 The range of existing Iranian ballistic missiles has grown to more than 2,000 kilometers, which would mean they could easily reach Eastern Europe, as well as countries such as Turkey, Saudi Arabia, Israel and Yemen. In addition, Iran’s medium-range ballistic missiles have the capability to carry several warheads. The Trump administration cannot deter the Iranian regime from pursuing such aggressive policies alone. Unfortunately, the P4+1 have not reacted forcefully enough or taken measures to hold the Iranian government accountable for its increasingly frequent violations. China and Russia, which enjoy strategic, geopolitical and economic alliances with Tehran and favor Iran’s counterbalance stance against the US and its allies, tend to embrace Iran’s justification for launching the missiles. Even though France and Britain expressed concern over the launch and requested a closed-door meeting of the UN Security Council, they and other European countries appear to have even less incentive to publicly hold the Iranian regime accountable. This is due to the fact that the EU desires to keep the nuclear deal alive and protect economic and trade ties with Tehran, particularly in the energy sector. Nevertheless, the Trump administration cannot deter the Iranian regime from pursuing such aggressive policies alone. Furthermore, since Iran is cognizant of the fact that launching ballistic missiles is not going to elicit a robust reaction from the other members of the UN Security Council or the EU, Tehran is likely to continue its proliferation and launching of ballistic missiles. Advancing its ballistic missile program, regardless of international norms, has become a core pillar of the regime’s foreign policy. The Islamic Republic currently possesses the largest ballistic missile arsenal in the region. In an attempt to further increase geopolitical tensions, Iran’s state-owned media outlets and politicians this week celebrated the launch of a stealth warship in the Gulf. Iran had previously declared its plans to establish navy bases in several countries in the region, including Yemen and Syria, and send vessels to South America. Contrary to the Iranian president’s rhetoric about the importance of deploying diplomacy and dialogue in the region, as well as on the international stage, Iran’s Supreme Leader Ali Khamenei and the senior cadre of the Islamic Revolutionary Guard Corps (IRGC) have recently placed significant emphasis on increasing the regime’s military capabilities. At the end of the day, Khamenei and the IRGC enjoy the final say in Iran’s domestic and foreign policies. By launching ballistic missiles and a stealth warship in the Gulf, the Iranian regime appears determined to escalate tensions in the region and seek every opportunity to project its power in order to reassert its hegemony. The international community ought to hold Tehran accountable for its military adventurism and violations of international standards.